It is not a steely-eyed egret nor heft of pelican but just a singing bird that catches my fancy from a balcony perched across from pines lining the marina. Here I make watch of another shifting sky, distant buoy sounding swells in the bay, common robin chiming in on the wind. But this bird makes its roost in the forked trunk, where branches droop heavy with cones. Like this robin, I try to perfect a voice in the intimate language of birds, call back at it, parroting the rise and fall of its wistful warbling, practicing the melodic whistling. Everything readies for something – above, wide wings of dark crows fan the horizon. Below, a ray steers clear of a row. A dog splashes into the water, his boy crying for a lost oar. Twilight settles on tapping riggings and masts, breeze in the tinny chimes, spring in the song. Copyright 2014 Andrena Zawinski. This poem won first prize in the Tiferet Journal 2014 contest. Andrena Zawinski was born and raised in Pittsburgh, Pennsylvania and now lives in Alameda, California. 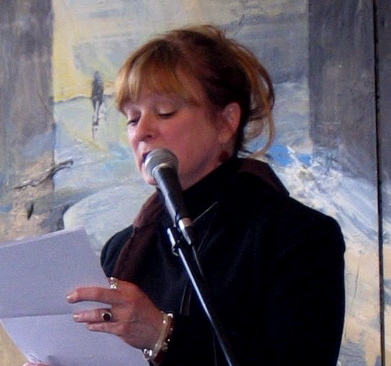 Zawinski has been PoetryMagazine.com‘s Features Editor since 2000. Her latest book is Landings, published by Kelsey Books. #Haiku Happenings #10: Vox Populi presents Andrena Zawinski’s 2014, first-place winning #haibun “Singing Bird Haibun,” from the Tiferet Journal 2014 contest! This entry was posted on March 6, 2018 by Vox Populi in Environmentalism, Poetry and tagged Andrena Zawinski, Basho, beauty of nature, haibun, joy of nature, Singing Bird Haibun.